Nearly half of Americans use supplements—and many more are curious about them—yet questions abound. Will feverfew help my migraines? Are there any vitamins that will keep my skin clear? Does lysine really prevent cold sores? Are there herbs I can take to boost my mood? Are any of these things safe? Mark Moyad, MD, MPH is the only physician in the United States who has an endowed position to study vitamins, minerals, herbs, and other supplements. For the past 25 years, he’s been researching supplements, using them in his practice, and traveling the country giving lectures to laypeople and physicians about what works and what’s worthless in the world of drugs and supplements. 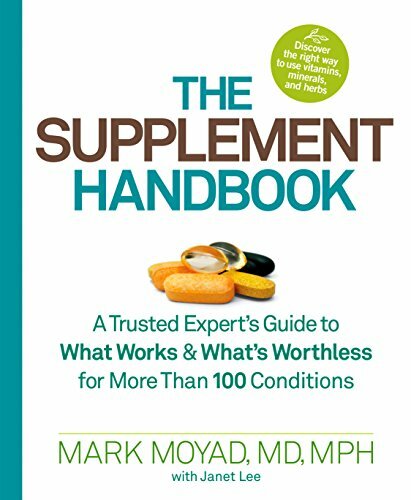 Based on the latest research as well as Dr. Moyad’s clinical experience, The Supplement Handbook guide you through the proven (or debunked) treatment options for more than 100 common conditions—everything from arthritis, heartburn, and high cholesterol to fibromyalgia, migraines, and psoriasis. Dr. Moyad provides clear guidelines, sifting through conflicting information for a definitive answer you can use today. He does not hesitate to point out which remedies are overhyped, useless, and even harmful. He even ranks the most effective options so you know which remedies to try first, and he’s honest about when over-the-counter or prescription drugs are the better option. More than an overview, The Supplement Handbook delivers prescriptive, reliable advice. Whether you’re an alternative medicine convert or an interested-but-confused supplement novice, this comprehensive, evidence-based guide is sure to become a must-have reference in your home.